hot damn that was a lot of responses to my post yesterday on how we decide what to read next! just…. wow! Thanks to everyone who responded, it’s going to take me a while to respond to everyone’s comments, please don’t hate me too much. There was something that prompted that post. I ordered a couple of titles I’ve been meaning to buy for a long time. I requested a few ARCs from publishers (I try to only request something that I KNOW I am going to read). 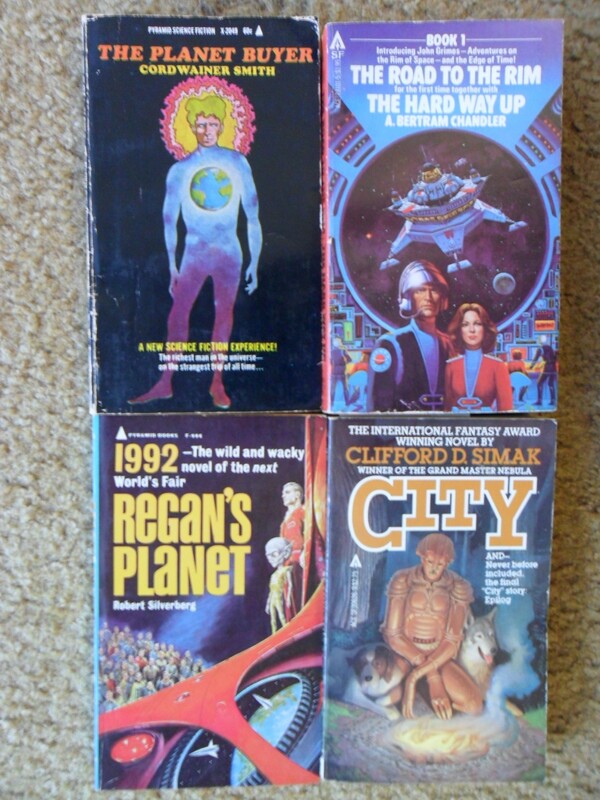 I found some old stuff I wanted on paperback swap. Everything showed up at the same time, nearly gave the poor mailman a coronary. 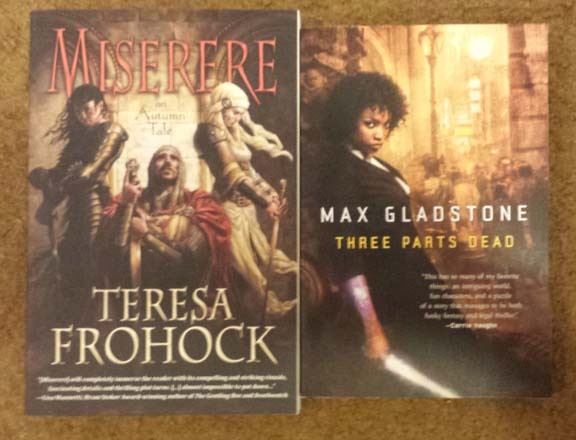 and this doesn’t include the three other ARCs I requested, which should show up any day. I have returned from California! sleep has been had, coffee has been drunk, contact lenses have been replaced and hair has been washed. now I just need to check with HR and see if I can take all of next week as vacation. note to self: do not take the red-eye next time. it’s just not worth it. who would have thought that a Sacramento to Minneapolis red-eye would have been overbooked? is that flight really this popular? the big guy sitting next to me fell asleep on my shoulder (not cool), but I got to watch a thunderstorm from the sky (super cool). 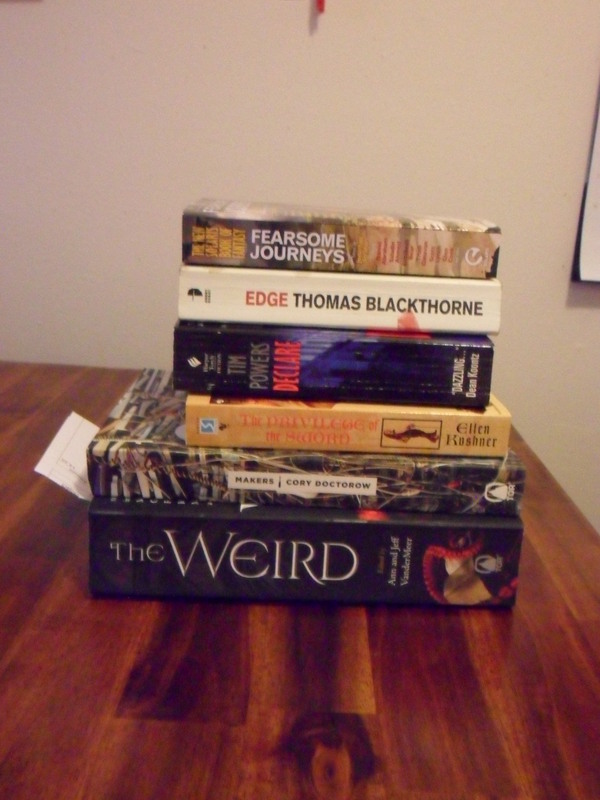 While I was gone, an obscene quantity of books showed up at home. Husband nearly flipped out as the stacks grew. He says I’m on book buying probation until I cull some of my collection. I really can’t argue with him. Warning: photo dump starts. . . NOW. 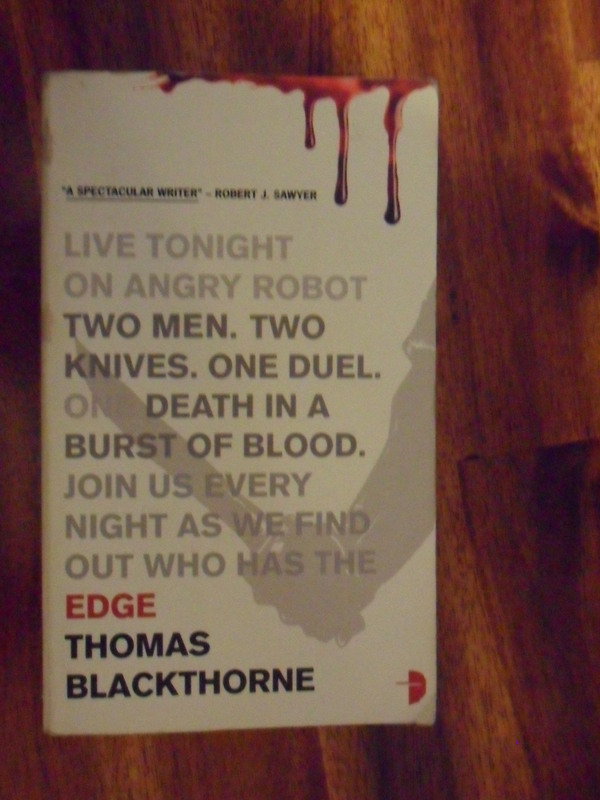 I’d never heard of Thomas Blackthorne before, but how can you say no to this minimalist yet effective cover art? The first post on my January Vintage SciFi not-a-challenge got so much comments/conversation, I figured it was time to do a teeny bit more planning and organizing for this thing. Cuz thanks to everyone’s (that’s YOU by the way!) excitement , it looks like it’s gonna be big and awesome. let’s get right to the FAQs. What counts as vintage? I’m gonna say anything Science Fiction that was published before 1979. Sword and Sorcery counts. Sci-Fantasy counts. short stories count. Jules Verne and Mary Shelley’s Frankenstein count. Anthologies count. If it was published before I was born and you consider it Science Fiction, it counts. What’s a not-a-challenge? Exactly what it sounds like. This isn’t a challenge, it’s just a fun thing to help garner some attention to all that wonderful classic, golden age, vintage SF that influenced many of your favorite contemporary writers. Other than Herbert, Asimov and Heinlein, I’m woefully underread in the classics, so this is my chance to make up for some of that. There are no sign ups, no points, no contests, no prizes. Read one vintage SF book or 10, or 50 or Zero. Actually, don’t read 50, that would make me look like a total slacker. and then I’d cry. How can bloggers who are participating identify themselves? I’ll come up with some kinda badge-y jpg thing, soon, I promise. you can put it in the side bar, or in the post, or whatever you feel like doing. If I’m really smart, I’ll start a Vintage SF tab up top on the page and you can post your links in the comments section. Ok, he didn’t suggest Regan’s Planet by Silverberg, but it’s a Silverberg! Resistance is Futile. Ahh, the smell and feel of new books. Even if they are only new-to-me. Even if they came from the library and I have to give them back. They are still the physical object known as book, usually smooth on the outside by not always, often shiny and sometimes embossed. Sometimes with print on three of six faces, alluring cover art or none at all, dearest book thing how do I love you? 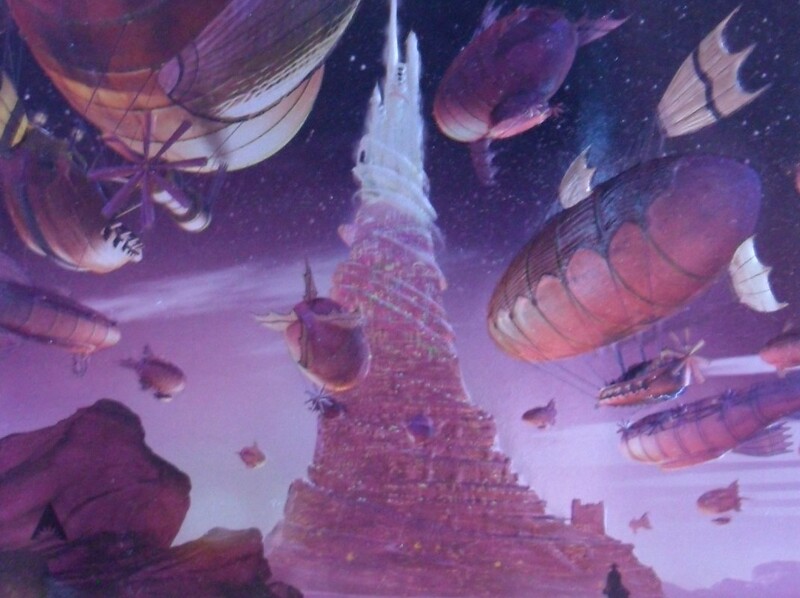 Terminal World, by Alastair Reynolds. I didn’t have much luck with Reynolds’ debut novel, Revelation Space, it was an “almost” book for me. Almost awesome, but not quite. 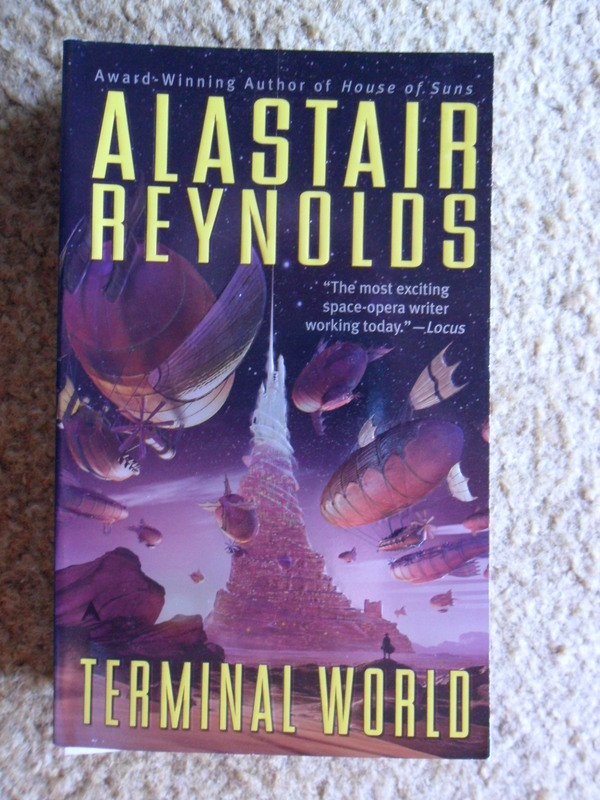 So when Terminal World was announced as my local SF group’s October read, I was excited to give Reynolds another shot. I’m about 100 pages in, and so far, so good! 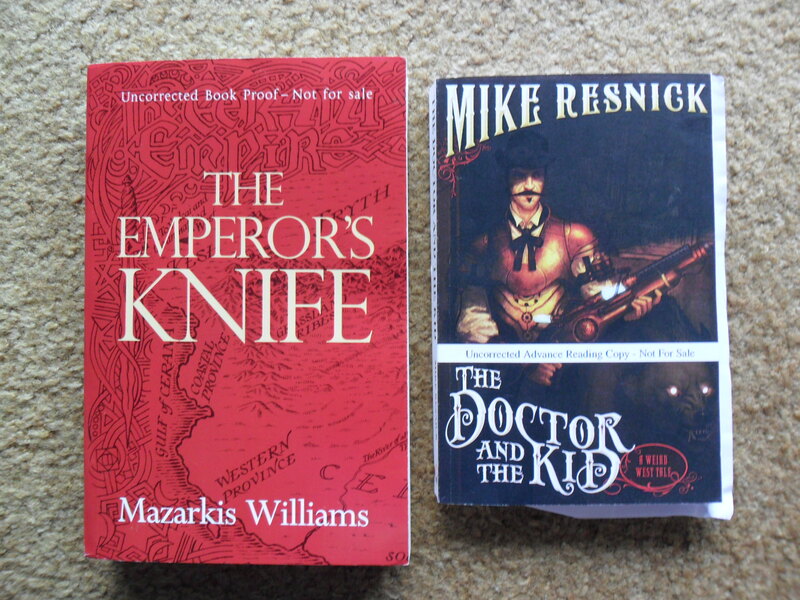 I feel privileged to have gotten an ARC of Mazarkis Williams’ The Emperor’s Knife, it looks incredible. Epic fantasy, but not as we know it (or at least, not exactly). Tattoos that take over your mind as they take over your body, intricate games, battles of the mind. . . this baby just got jumped to the top of the TBR list. 2011 has been a year of incredible epic fantasy for me, and so much of what I’ve read has been the first or second book in a series, with the next book expected sometime in 2012/2013. I love that every year it just gets better and better!! Mike Resnick’s The Doctor and the Kid is the sequel to last year’s The Buntline Special. A wild wild west full of steampunk inventions and Native American magic, it’s not the deepest thing you’ll ever read, but it was a helluva lot of fun. Westerns typically haven’t been my thing, but Resnick’s Doc Holliday rocked my world. Wow, that’s a crappy picture! Book pr0n it ain’t! That’s what I get for taking pictures when half asleep. oh well. The World House: Restoration, by Guy Adams is an ARC from Angry Robot books that will hit your local bookshelves in July. It looks wonderfully creepy. Stay tuned for reviews of Guy Adam’s first book, The World House, and this new one in the next few months. M John Harrison’s Viriconium – Three novellas and a handful of short stories taking place in his Viriconium world. A post-post-post apocalyptic Earth where everything but surreality is scarce. Harrison is known for dreamy, surreal prose and storylines that overlap in time and space. I read this book about five years ago, I hope it’s as good as I remember. 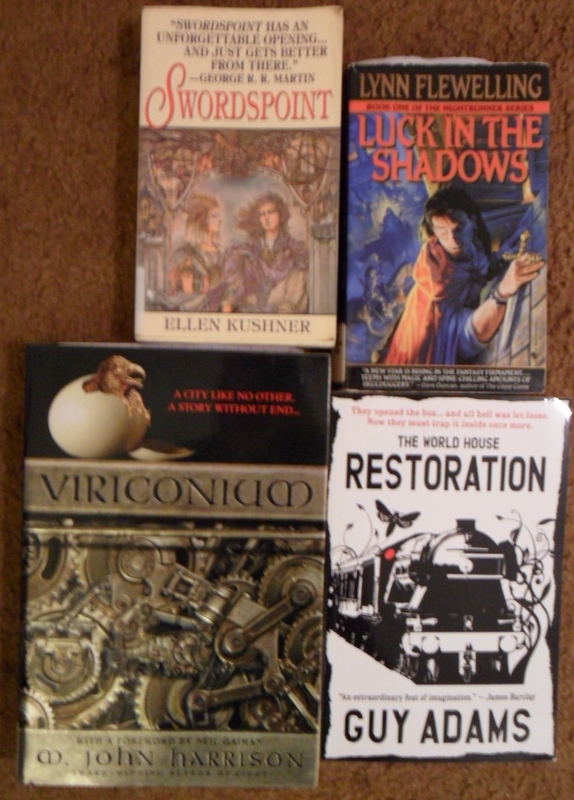 Thanks to recommendations from @Mascheph and some discussions on Gav Reads, I picked up Ellen Kusher’s Swordspoint and Lynn Flewelling’s Luck in the Shadows along with Anthony Burgess’s The Wanting Seed. On first blush, the Burgess looks the most interesting. 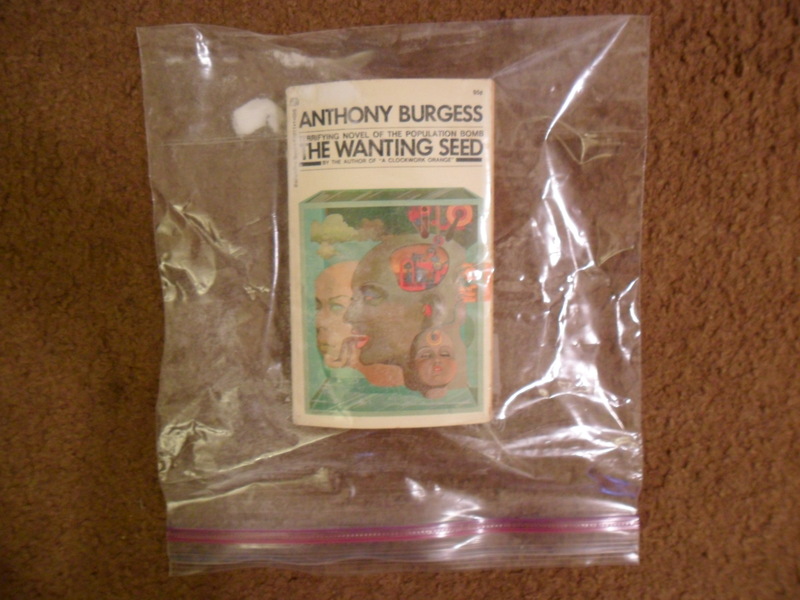 Why is this copy of The Wanting Seed in a zip lock bag, you ask? Because I got it randomly at a garage sale a few days ago. And wow was it musty and smelly! Thus the zippy bag and baking soda. Book should be not-to-stinky in a few days. Don’t tell anyone, but sometimes when I get super cheapo stinky books (this one cost me a quarter), after I read them I throw them out. If the book is really good, I’ll buy a not-stinky copy or get it from the library. I just don’t want to fill up my bookshelves with stinky stuff that’s falling apart, you know? If you have read and or reviewed any of these, please let me know in the comments. Look at some new goodies I have! From the publisher (Thanks Pyr!!!) 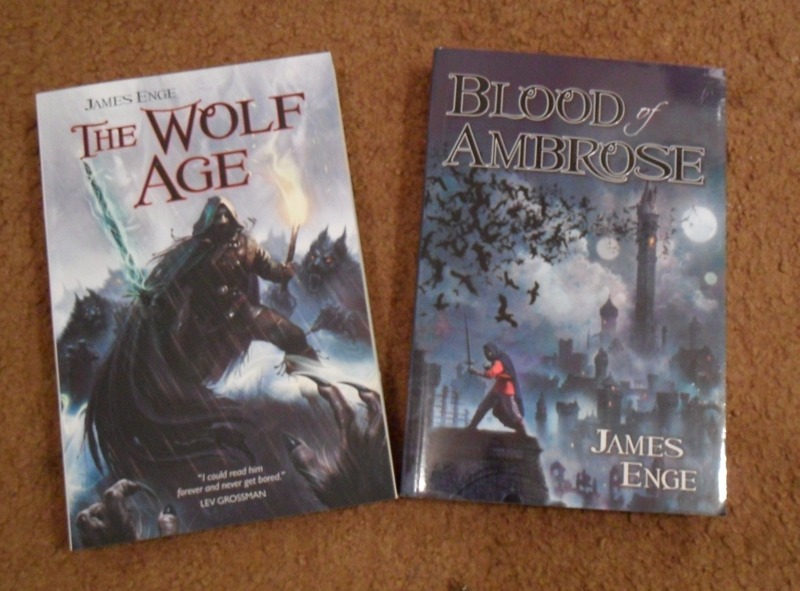 we’ve got The Wolf Age and Blood of Ambrose by James Enge. I’m super excited about these, I think Enge is right up my alley. BTW, check out the Enge novelletta, Traveller’s Rest on the PYR blog. you can download it all e-book like, or if you are super-old-skool like me, you can print it out and read it, killing a tree and promoting use of toxic printer ink. The first three (is there more than three??) 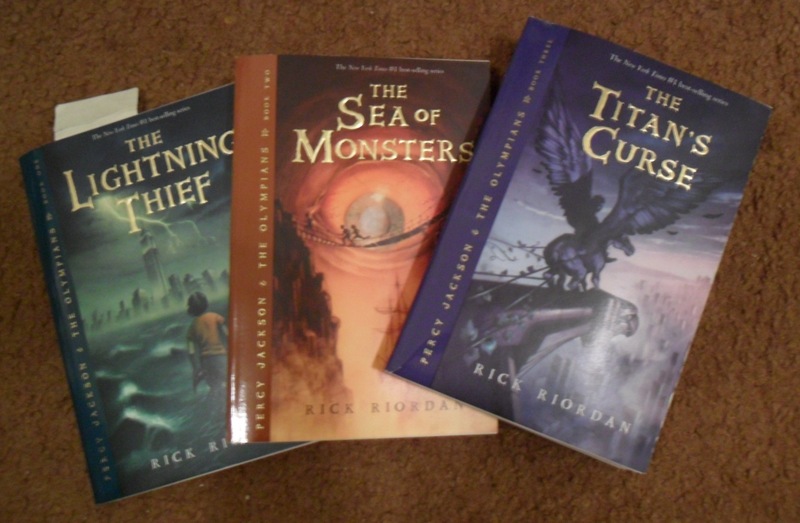 Percy Jackson and the Olympians books by Rick Riordan. See that bookmark in the first one? I started reading it yesterday, and I gots one question: why isn’t all YA stuff this good? Also, I’ve got Joe Hill’s Horns on hold at the library, to be picked up tomorrow, hopefully along with some classic Robert Silverberg. Progress made towards my New Years Resolution to read what I’ve got instead of aquiring new stuff? ZERO.